Guitar Blog: Did you practice guitar today? Did you practice guitar today? 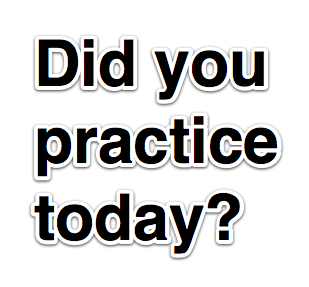 On an A4 piece of paper or bigger write the following question; "Did you practice today?" Post this question in a place where you can't miss it each day for a month. Perhaps on the fridge or bathroom mirror. Now after one month look at your practice log to see whether you have done more practice as a result. Let me know if it makes a difference. Do you trust your guitar teacher?